.Quiltscapes. : Shall We Gather II: Smocking! 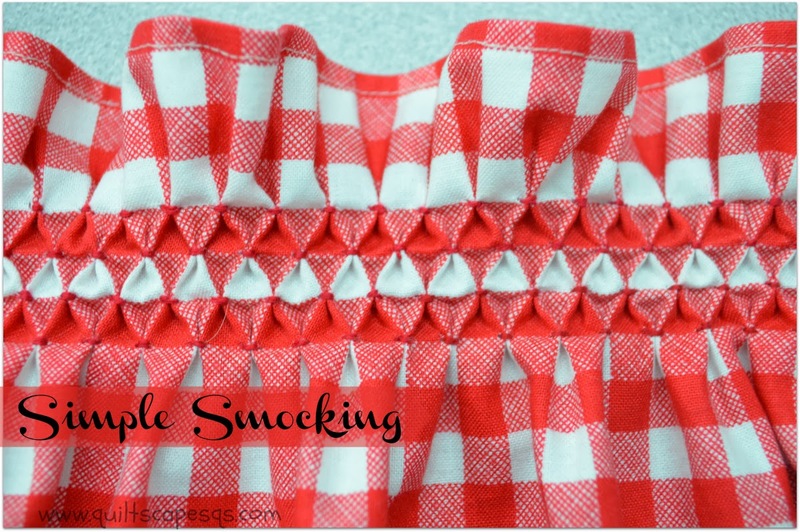 Shall We Gather II: Smocking! I love this adorable vintage needlework technique! Used before elastic was ever invented, smocking is a simple embroidery method to gather fabric into a decorative pattern at cuffs, necklines, bodices and so on. The tucks and pleats allow the fabric to stretch. Let's get started with our "Smockery"! It's easy to try and easy to learn. Especially if you use Gingham. Grab a scrap of gingham fabric, with the square checks spaced at least 1/2" to 1" wide. If you can't readily find gingham, try using a print with a regular, evenly-spaced pattern such as Swiss dots, so you don't have to mark your fabric. Otherwise, plot out a grid on the right side of your fabric using a ruler and removable marking instrument. Then all you need is a wide-eye needle, some floss and a pair of scissors, and you're ready to go! Practice on a small swatch of gingham print, twice as wide as your desired width, then add an extra 2" to 4" around the edges of your work area. Here's a little demo to get going. Working on one row at a time, we'll make little pleats at the horizontal arrows, and allow the floss to glide beneath the fabric at the vertical arrows. It will all make sense with the pictures! Use perle cotton or two strands of embroidery floss. Tie a knot in one end. Bring thread up at your starting point. Take a tiny stitch where your thread came up to anchor the stitch. Travel horizontally to the LEFT corner of the square, and take another tiny stitch. Take 1 to 2 more whip stitches, catching both corners. There's your first tuck. then travel under the fabric vertically and bring your needle out at the next point. Use the following diagram to see how to travel with your stitches. I am right-handed, so it's easier for me to work from right to left as I stitch. If left-handed, work in the reverse from left to right. Here's how a few stitches should look. See the lovely little triangle-shaped pleats you've started? Just keep repeating the process. Remember, Horizontal stitches are pulled, and always out front. Vertical stitches are relaxed, and always travel behind. but you will also have lots of exposed threads on the back = snags. Grandma called those "toe-catchers" Ü. That's better. 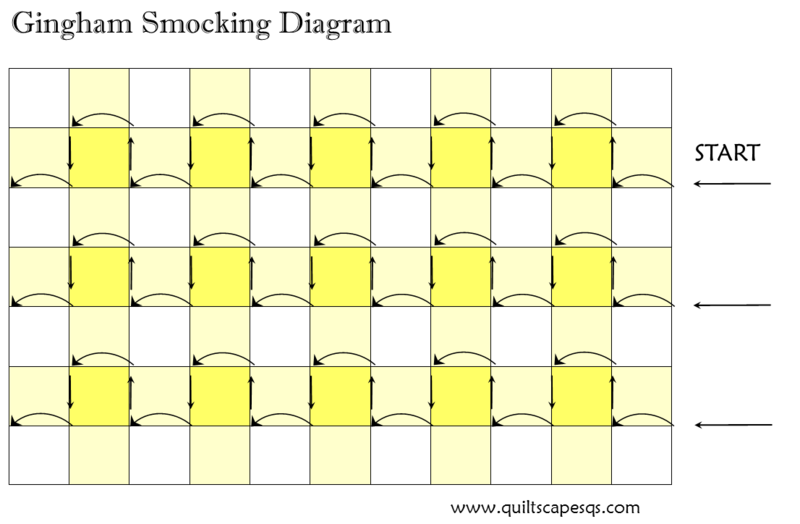 Traveling threads are vertical between tucks. Smocking will not reduce the length by much, but it will reduce the width by about half. Now, if only I had cut this strip long enough, it would have made a cute headband! Travel vertically to the next corner, and bring the thread out to the right side. Thread should be relaxed, not pulled when you travel up or down. ...then tighten to form the pleat. Take one or two more whip stitches in the same holes to secure. Travel vertically to the next corner by taking the needle through to the back. Remember, do NOT tighten the stitch. Tie a knot when you get to the end of your thread, then lace up and keep going until you get to the end of your project. See how it forms the secondary pattern between the two rows we worked on? We've just made two passes and it created another set of tucks between the rows (white triangles). Three Rows. Remember, we're only working on every other row. See? Simple. Looks way more complicated than it really is. OK! Now that you've mastered the technique, go make something SWEET! Find the pattern for this adorable, sweet, simple smocked apron on my Esty Shop HERE. Gingham Love! ♥ Hope you enjoyed this tutorial! It's just one of several vintage-y techniques I've enjoyed exploring. So much to learn, so much to do... There's always something cooking around here, and now I'll be all set in my "little old lady" apron, LOL! Stop by again soon! to be finished in the warming oven. were ideal hiding places for shy kids. to replace that old-time apron that served so many worthwhile purposes. apple pies on the window sill to cool.